Lightness, which artists traditionally refer to as value or tonal value, is the light or dark of a color independent of its chromaticity (hue and chroma). Given all the space devoted to hue in color theory, it is surprising to learn that value is the most important design element of a painting. It is hard to overstate the importance of good value structure to the impact of visual art. Lightness or brightness is only thing that the oldest visual systems were designed to perceive. Even when color vision appeared in mammals, it was basically a matter of long wavelength light compared to short wavelength light  yellow against blue  which remain in our color vision as the hues that have, at their peak saturation, the widest difference in lightness. This page develops the perceptual importance and complexity of lightness in our visual response, and explores the various ways artists think about, measure, and control the value structure in visual works of art. Value dominates our visual experience. It is the strongest element of visual contrast and largely determines our perception of form as we explore a picture. It defines our perception of space through the luminance differences between the lighted and dark surfaces of three dimensional objects and long distance effects of aerial perspective. Even in an abstract or pattern design, lightness dominates hue as the patternmaking element in a picture. As a simple illustration, I've modified a painting by Edward Hopper either to remove the variations in chromaticity (setting CIELAB a* and b* to zero) leaving only variations in lightness, or to remove the variations in lightness (setting all CIELAB L* values to 60) leaving only the variations in chromaticity (images, below). The remarkable similarity between the original color and the black and white versions, compared to the noticeable impoverishment in the unvalued version, demonstrates the importance of value in a painting's overall composition and visual impact. Notice how strongly the black and white image seems to guide your eye! The comparison may suggest that a picture with a limited value range will appear flat and uninteresting. This is not literally true; a painting with a reduced value range can be visually exciting, as many paintings by Monet or Whistler will demonstrate. But if a painting has a poor compositional arrangement of values within its value range, there is little that color, texture, or line can do to salvage it. 1. Absolute luminance. When we perceive brightness or lightness, we fundamentally respond to the quantity of light energy reaching our eyes from objects and surfaces around us. This is the "objective" component of brightness or lightness. The environmental range in luminance values is huge (diagram, right). As a conservative estimate, from the luminance of a white paper under a night sky (about 10-2 candelas per square meter) to the luminance of a frosted 60 watt light bulb (about 105 cd/m2), a ratio of about 1 to 10 million or 107. 2. Response range. In light sensitive media, the response range comprises all luminance values that produce a perceptible change in the media, and a perceptible change if the luminance is either increased or decreased by a proportionally small amount. The response range is bounded by thresholds at high and low luminance values. The lower limit ("noise") is defined as the highest luminance that does not produce a perceptible difference in the light sensitive media if it is reduced, and the upper threshold ("saturation") as the lowest luminance that does not produce a perceptible difference if it is increased. The response range is typically represented as a characteristic curve that shows how relative luminance levels (on a logarithmic scale) are transduced into proportional media densities (on a linear scale). For physical reasons, light sensitive electronic and chemical media have a relatively small response range, given fixed optical aperture and exposure times. The best CMOS chips, for example, have a response range somewhat above 104 or 1:10,000; photographic film and video displays have a response range of about 103 or 1:1000 (shown above), and photographic print papers have a response range of less than 1:100 or 102. By comparison, human color vision provides a large response range that is at least 1:100,000 or 105 at most adaptation levels. 3. Luminance adaptation. Because the response range of all light sensitive media is relatively limited in comparison to the absolute range of luminance valuess in the environment, the exposure of the media to light energy must be adjusted, by means of aperture size, exposure time or filters, so that the environmental luminance values fall within the fixed response range of the media. In a similar way, luminance adaptation shifts the response range of the eye so that the visual system becomes less sensitive when light is very abundant, and more sensitive in the dark. These shifts involve changes in pupil size, changes in the proportion of unbleached photopigment in the retina, and changes in the response sensitivity of visual pathways in the brain. The total light reflected in all directions from a surface, as a proportion of the total light incident on the surface, is called its reflectance. Luminance adaptation is largely governed by the average luminance of the entire visual image, which in almost all environments is the average reflectance of all surfaces, called the adaptation gray. The adaptation gray is usually equated with a reflectance of about 20%. Roger Clark estimates that scotopic vision corresponds to a photographic ISO of about 800, whereas photopic vision corresponds to an ISO of about 1. This suggests the dimension of visual adaptations between scotopic and photopic vision.  Scotopic vision is the visual adaptation to night environments, roughly with surface luminance values below 0.1 cd/m2. Scotopic vision provides no chromatic (hue and chroma) sensations at all, so that all surfaces appear to be shades of gray; white surfaces appear to be a silky silvery color, and gradations in lightness below middle gray are indistinguishable.  Photopic vision, at the other extreme, is the visual adaptation to sunlit outdoor environments, roughly with surface luminance values above 300 cd/m2. Photopic vision provides the maximum visual contrast between light and dark surfaces and the maximum sensations of hue and chroma; discrimination of surface colors is good down to very low luminance factors.  Mesopic vision is essentially a mixture of scotopic and photopic adaptations, and is the common luminance adaptation in indoor environments under artificial light or restricted daylight, where white surfaces have a luminance of roughly 10 to 100 cd/m2. Contrast and chromatic variety is muted, moreso as illumination decreases, and there is some loss of discrimination among very dark surfaces.  lightness contrast  lightness contrast peaks under photopic illumination, and becomes slightly more muted under mesopic illumination: the perceived contrast between light and dark values is reduced, and we can discriminate fewer steps in a graduated value scale; then the contrast ratio between light and dark values (the visual response range) is fairly constant down to luminances of about 10 cd/m2, and then becomes more restricted.  bright luminance  under photopic illumination few lights (often, only the sun and highlights or reflections of its luminance) appear genuinely "bright"; all other lights appear to be merely glowing or "super white"; but under low mesopic and scotopic illumination, even illuminated surfaces, such as the walls of an illuminated room viewed from outside through a window, appear as bright as lights. 4. Anchoring. It appears from experimental evidence that the visual system perceives the absolute overall luminance only poorly and slowly, and much of the information about the environmental luminance comes from the apparent contrast among all surfaces, determined by looking at the pattern of lightness differences at each color edge. Because the reflectance of surfaces is always within 1% to 99% (and is commonly within 5% to 95%), the contrast ratio of diffusely reflecting surfaces is typically 1:20 or less. In addition, the most sensitive lightness discrimination across all adaptation states is in light valued or near white surfaces. This typically puts adaptation gray in the lower half of the visual response range. Thus, the luminance that produces a 50% visual response on a characteristic curve may be less than 10% of the luminance saturation threshold. The "excess" visual response capability at higher luminance values is available to handle the "glare" luminance of reflected highlights or the direct imaging of light sources. This produces a perceptual contrast, within the response range at any adaptation level, between lightness and brightness. Lightness is the perception of luminance that is less than the luminance of an area perceived as "white" (diffusely reflecting nearly all the light that is incident on it). As luminance increases above this level, color areas seem to glow or fluoresce, and finally to shine as lights; these perceptions appear subjectively different from surfaces, as brightness. Color vision establishes the boundary between these two sensations through lightness induction. In most viewing situations, lightness anchoring appears to put the "white" response approximately around the middle of the visual response range  as appears, for example, if we fit a plot of lightness values (CIE L*) on log luminance values (CIE Y) over a schematic visual characteristic curve (diagram, below). This creates a dynamic relationship between the average scene luminance (luminance adaptation) and the perception of white surfaces (lightness induction). 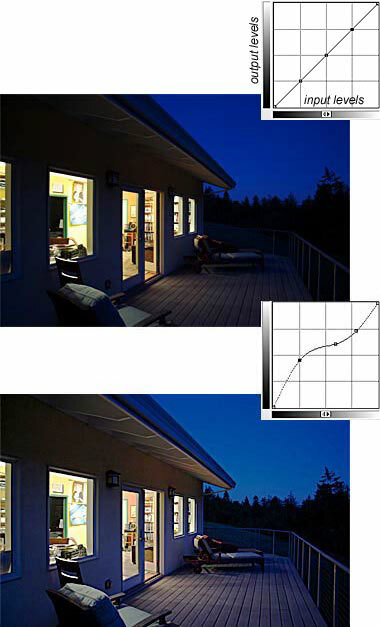 If a brightly illuminated surface suddenly appears in a dark adapted field of view, luminance adaptation will decrease sensitivity in order to shift the luminance range downward within the characteristic curve, and the illuminated area will decrease in brightness enough to permit perception of it as a white surface. Alternately, when entering a dark environment, luminance adaptation will increase sensitivity until the most luminous surfaces in view are near the middle of the response range. The exception seems to be low mesopic and scotopic vision, where physically white surfaces always appear distinctly gray, when compared in imagination to the same surfaces in sunlight. This implies that the lightness range has shifted even farther down the visual response range. Consistent with this fact, we lose discrimination of darker values as light becomes dim, and under scotopic vision cannot see the difference among values below a middle gray. As shown by the characteristic curve, this is because large proportional differences between low luminance values have no effect on the visual response at the bottom of the curve. 5. Relative luminance contrast. The dynamic relationship between adaptation and lightness induction extends rather deeply into lightness perception. A single illuminated surface isolated in darkness can appear to be white, even when it is actually black (very low reflectance). Alan Gilchrist and colleagues have shown that persons looking into a hemisphere that filled their field of view and was painted various patterns of dark gray and medium gray, saw the patterns (after adaptation to the dome illumination) as painted light gray and white (diagram, below). The shift in the perceived lightness does not change the relative lightness contrast between the color areas, so that the luminance proportions seem to be preserved. This shows, among other things, that accurate lightness perceptions require variations in surface reflectance across a representative range of luminance contrasts. However, the effects of luminance contrast can also be quite local, as shown in the Bartleson Brenneman effect (image, below). Here the background lightness influences the apparent gradations of gray. A dark background pushes all gray values toward white, compressing their perceived lightness differences; but a light background shifts the values toward black, enhancing the apparent lightness contrast. 6. Scene spatial interpretation. Finally, the dynamically limited, luminance adapted and white anchored luminance variations are imputed by color vision to actual objects, and their surface colors are interpreted in terms of the spatial orientation of their surface to the sources of illumination in the environment, including the relative intensity of light sources, the effects of cast shadows or barriers, the presence of windows, and so on, all of which constitute a spatial interpretation of the scene. Spatial interpretation has a very large effect on color appearance. 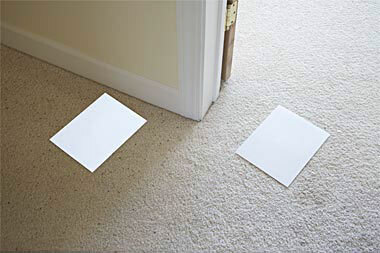 As a simple example, the first photo (below) shows two sheets of white paper photographed in a spatial context in which one sheet is in shadow and the other in direct daylight. In the two photos below it, the color of the illuminated sheet is copied into the location of the shadowed sheet, or the color of the shadowed sheet is copied into the location of the illuminated sheet. Here the "shadow" color appears much darker when it is located in the illuminated spatial area, and the "light" color appears much brighter when it is located in the shadow spatial area. 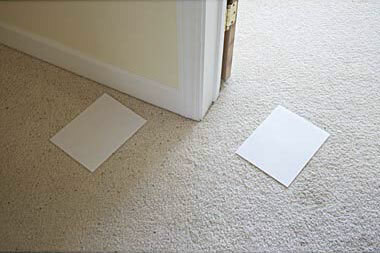 These color shifts are not simply due to the relative luminance contrast of the paper colors with the surrounding carpet colors, because the apparent sizes of the color shifts are much smaller when the spatial context is removed and the identical computer monitor colors are presented as two dimensional contrast figures (diagram, below). I find the contrast between the "shadow" lightness photograph, when compared to the two dimensional display, to be especially striking. The photograph creates the unambiguous impression that the shadowed paper is white and the illuminated paper is a middle gray; in the two dimensional display the two colors appear nearly the same value. In the "light" lightness photograph, observe the impact that spatial and luminance contrasts have on the perception of brightness. The paper in spatial shadow seems so light valued that it glows. Overview of Lightness Components. This section has presented the six conceptual dimensions for analyzing, and by means of the analysis viewing accurately, the lightness gradations in any scene. The diagram (below) summarizes how these different components of lightness should be evaluated. The absolute level of environmental luminance, and the inherent capabilities that define the visual response range, are "fixed" or given in context. These two in combination approximately determine the luminance adaptation, which (as described above) has profound effects on visual experience. Given an initial or adjusting luminance adaptation, the visual system attempts to find the correct spatial interpretation of the scene, including the location and orientation of objects in space and in relation to sources of illumination; this process entwines it with white anchoring, and the interpretation of relative luminance contrasts, which in turn provide a more accurate understanding of the scene illuminance that can affect the luminance adaptation. The upshot is that judgments of lightness are highly sensitive to the perceived location of surfaces in three dimensional space, the amount of illumination and the direction of incident light that we perceive is creating the relative luminance contrasts across surfaces, our inferences as to what is a "white" luminance in that environment and from that inference what is the reflectance of other visible surfaces; our overall luminance adaptation or adjustment to the average luminance reflected from all surfaces around us. In effect, these dynamic relationships are the artistic language of a representational image, as expressed in the reflectance patterns of paints and inks. Nonrepresentational painting may have other priorities, but the painter still cannot neglect the ultimate visual impact of the painting's surface colors as these will appear when the painting is viewed in a gallery presentation. Let's now focus on the relative luminance values that define increments in lightness variations. For the artist, the key issues are: how many lightness steps are perceptible, and how should those lightness steps be defined? How Many Lightness Steps? The lightness scales used in almost all modern color models define no more 100 lightness values. This is the cumulative range of stepwise luminance increases, starting at pure black, that can be perceived as a "just noticeable difference". Roughly 100 of these just noticeable increases in lightness value arrive at the value of white, beyond which any luminance increase produces the sensation of glowing or self luminous color. Lightness discrimination is dependent on the way colors are displayed, but two visual examples  a lightness gradation scale and a complex image  illustrate the validity of this approximate limit. An 8 bit computer monitor can display up to 256 gradations of lightness, which appear as an unbroken continuum and as a maximally detailed black and white image of geese in rippling water. Very faint scalloping at increment edges appears at 128 gradations, and distinct scalloping at 64 gradations, although the detailed image with 64 lightness values appears, to my eye, indistinguishable from the 128 or 156 images. Clear increment separations, and some image degradation, appear at 32 lightness intervals, and the image becomes significantly degraded at 16 intervals. However, display patterns affect lightness discrimination. The scale (below) shows that 50 lightness gradations produce a perceptible scalloping or Mach banding at the edges between contiguous lightness areas, assisting the discrimination among the edges. But if the edges are separated by thin black lines, the difference between neighboring lightness areas disappears. So far, we have only been examining the perceptual limits of lightness perception on a single surface under uniform illumination. Let's now take a broader view to understand how lightness increments are discriminated by an artist (diagram, below). We start with the natural light luminance variations of any outdoor scene, for example, the view of a snow covered mountain. Although we can't have a precise measure of every single luminance value visible in the scene, one million (106) would be a plausible estimate. Typical black and white photographic film may capture only about one thousand (103) discriminable density values from this scene; when the negative is printed on black and white photographic paper, this is reduced further to only one hundred (102) reflectance values  the limit of human lightness discrimination. Now, suppose we ask a skilled artist to paint an enlarged copy of this photograph, but using only premixed values of gray paint (image, above). How many paints would be necessary? If we assume that the 100 just barely different values in the photograph are scattered around a complex scene, then it's reasonable to assume that the painter will confuse one lightness value for another  the lightness L* = 50 would be randomly confused with L* = 49 or L* = 51, and the painter would just as easily confuse the corresponding gray paints. This implies that each lightness level can stand for three, or that just 33 unique values of paint would be sufficient. And, if we compare the 32 color and 256 color reproductions of the complex image (shown here), that seems completely plausible. Finally, consider that the artist is going to paint the mountain scene by direct observation, without the reference photograph, using only tubes of paint. He or she is swimming in the sea of a million colors again, which are transferred to the canvas as only 100 perceptibly different lightness values, using only two colors (black and white) and their mixtures. Two reproduction processes are involved: there is the uncertainty of identifying one of the 100 values in the landscape, discussed above; but now there is the additional uncertainty created by mixing exactly the matching lightness in paint. Here, if we assume that mixing values is about as inaccurate as identifying values, then the 33 values that are useful to actually paint the are reduced by a similar proportion due to uncertainties in the mixing process ... and we end up with 33% of 33%, or only eleven values. And, assuming that the painter lays down approximate colors as a "blocking in" of the painting, then modifies the relative luminance or lightness of the colors and details by visual judgment, as the painting develops, then the painter is really working with fewer values than eleven  perhaps only nine, or five, or even two. The Value Scale. How does the painter evaluate the differences in light or dark necessary to recognize values by eye or realize in paints in an intended value design? By means of a value scale. In this framework one can speak of the high lights, low lights or darks of a painting with workable precision. The terms are easy to remember, and easy to use as reminders of the major value levels used to develop a value composition. Watercolor tutorials typically explain values using a 9 step value scale  but confusingly, white and black are sometimes included in and sometimes omitted from the range! The basic value scale in the Munsell color order system is an 11 step scale ranging from 0 (black) to 10 (white). And the CIELAB L* dimension is very close to a multiple of 10 of the Munsell scale: a 6 on the 11 step Munsell value scale corresponds to a 60 on the L* dimension.  reflectance interval scales are calibrated to differences in relative reflectance from 0% to 100% (or as near to pure white and black as can be reached by physical pigments), so that step 10 is 100% reflectance, step 9 is 90% reflectance, step 8 is 80% and so on down to the lowest value. These equal reflectance scales produce finer apparent gradations of value in the lighter values (middle gray is at step 2).  media interval scales are calibrated to differences in the reflectance of art media  differences in the darkness of photographic prints produced by changing exposure or developing times, differences in the darkness of etchings produced by changing acid bath times, and so on. These scales show large intervals in reflectance and lightness at high values, which grow progressively smaller in darker values. The lightness of scale intervals is not logarithmic but compounded, sometimes at changing rates. For example, in a photographic gray scale, steps from white are decremented by 10.5%, so that if step 1 is white with a lightness 99, then step 2 is 89 (99 minus 10.5% of 99), step 3 is 80 (89 minus 10.5% of 89), step 4 is 72, step 5 is 65, step six is 58, and step 7 is 53, which represents middle gray. Then steps are compounded at 82% down to the lower reflectance limits of the media. Painters are sometimes instructed to paint out value scales for themselves, sometimes by mixing different concentrations of color for each step and sometimes by using the same dilution of paint in multiple glazes (more glazes for darker color). The glazing method produces the equal interval scales described above. The exponent scales must be painted using dilution recipes, and often the same proportional mixtures will produce the same intervals of value but anchored at a different maximum darkenss depending on which paint is used. 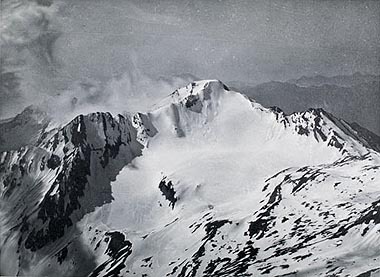 Notice that the artist's value scale is different from the standard photographer's grayscale, for example as manufactured by Kodak and sold in most camera stores. In these grayscales each step is a percentage increment in black pigment density (as explained above), so that the step marked M represents a middle gray (L* = ~50). The photographer's scale crunches up the range of light values and spreads out the darks. It is used primarily to evaluate exposure settings and image quality in the postprocessing and reproduction of photographic materials, because reproducing adequate detail from the dark values and setting the correct gray value are the more common difficulties in exposing, printing and reproducing photographic images. How large a value range should a painting have? This depends mostly on the subject, lighting, color scheme and painting style, but a wider range in value will usually have a stronger impact on the viewer. (Some artists enthuse about "punching up a picture with darks.") Our visual response to natural light encompasses such a large range that the photographic reproduction of outdoor scenes typically produces darks that are too dark (image, right). The practice of landscape painters and videogame artists suggests a useful rule of thumb: for an object outdoors and in direct sunlight, surrounded by dark surfaces, the shaded area is 60% of the value of the sunlit side. That is, if you estimate or measure the lightness of the sunlit surface, then take a bit more than half of that value, you have the approximate lightness of the shaded surface of the object. 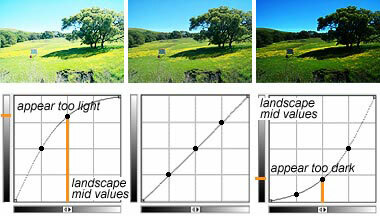 With the 11 step value scale we can return to the landscape painter's rule with more guidance. The handy shadow ball (at right) lets us illustrate basic lighting problems. If our representation of the light source or highlights on the object is given a value of 10, and a white surface a value of 9, then the sunlit side of a yellow or orange object has a lightness of 8 on the value scale. The shaded side will therefore have a lightness of about 5 (8 times 0.6 or 60% is 4.8). The cast shadows from the object depend on the intensity of indirect illumination into the shadow and the color of the shadow receiving surface, but in daylight the shadowed area is typically about 40% the lightness of the sunlit surface (that is, a lightness of 9 times 0.40, or 3.6), or 4 on the value scale for a white surface at 9. 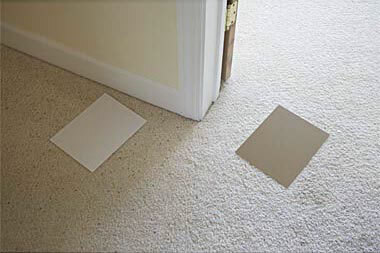 On overcast days, when light falls diffusely from all directions, all objects are less brightly illuminated, but the only shadows are cast shadows (underneath objects or in narrow passageways), and the 40% applies here too. These are only rules of thumb, but they provide reliable starting values. The shaded side of the object can be considerably darker than 60% of the lit side, if there is no indirect reflection onto the shaded side from other parts of the landscape. (The dark side of the moon is an extreme example.) And cast shadows can appear significantly darker than the shaded side of the object if they fall on a surface with a dark local color, such as grass or asphalt. There will always be some error in measuring the lightness of colored surfaces with a monochrome value scale, and in estimating a 40% lightness reduction with only 9 or 10 value steps to chose from. But the goal is to jump into the neighborhood of the correct value, not its precise tone. Once you've located the lightness of the sunlit side, just use the lightness step that is halfway to black (or the step just above halfway, if there are an even number of steps to black) as the value of the darkest part of the shaded side. When we make the step from estimating the lightness of various shades of gray on a grayscale to estimating the lightness of various colors, we confront a new complication in color perception: different paint hues reach their maximum saturation at different values. And because saturation is easily confused visually with lightness, this means that we tend to misjudge the actual value of different colors, perceiving some of them as lighter or darker than they really are. The Value of Peak Saturation. The figure below shows each of the 12 hues of the tertiary color wheel with the value 0 (for black) at the center, the value 10 (for white) at the circumference, and value steps of 2 indicated by the concentric circles. The gray squares show the approximate value of the maximum saturation in paints that can be achieved for each hue in the most extensive Munsell Book of Color. The general shape outlined by these squares  lopsided toward yellow and away from blue violet  is worth careful study, because it can guide your judgments of the actual value of different hues, and assist in relating the saturation of color areas to the basic value design. Before we get to that: why don't all hues reach maximum chroma at the same value or lightness? Because the eye is most sensitive to light in the middle of the spectrum rather than at the ends. These differences in the sensitivity of the color receptors to light of different wavelengths creates differences in the apparent luminosity of different parts of the spectrum. The value of a color is always related to the total proportion of incident light that is reflected by the color  but reflected "green" light always appears much brighter than the same amount of "blue" light, and intense warm colors in general reflect much more light than equally intense greens or blues. The next diagram shows how this affects the value of different hues of paint. Colors from deep red through light yellow have a "warm cliff" reflectance curve, so as the reflectance curve moves from A to B  from deep red to light yellow on the color wheel  it is as if a curtain is drawn away from a window. Bright reflectance expands across the entire long wavelength side of the spectrum, and this rapidly increases the value of color as the hue changes, while always maintaining the maximum saturation. The lightness starts at a dark value, since light at the far "red" end of the spectrum is at wavelengths where the eye is less sensitive to light  but lightness increases steadily as the hue approaches orange and then yellow, which at its maximum chroma has a high reflectance almost indistinguishable from white. As the hue continues into green (the span marked B to C in the color wheel), the "warm cliff" profile changes into a "hump" centered approximately on the dominant wavelength of the hue. The total area of reflected light has been reduced, but the impact on the apparent value is negligible at first, because the maximum reflectance is in the "yellow green" wavelengths where the daylight adapted eye is most sensitive to light. However, as the hue moves through blue green and turquoise and approaches middle blue (the span marked C to D in the color wheel), we enter a part of the spectrum where the reflectance curve is clipped on the short "blue violet" wavelengths, and the center of the hump moves into an area where the eye is again less sensitive to light. So the value of the intense blues begins to go down very rapidly. The value of saturated hues reaches its lowest point somewhere around a blue violet such as indanthrone blue or dioxazine violet (D in the color wheel): these colors consist of reflectance at the extreme "blue violet" and "red" ends of the spectrum, so all the high reflectance is concentrated in the areas where the eye is least sensitive to light. This produces the darkest valued colors. Finally, as the hue continues to shift from blue violet to red violet (D to A), stronger "red" reflectance is added rapidly to the color as the weaker "blue violet" reflectance is reduced, which causes the value of intense red violet paints to increase again. Value rises steadily until we reach a deep red, and we have completed the circle. Hue and Apparent Value. Let's come back to the fact that it's often difficult to judge the lightness of an intense hue. This occurs because, in each case, the most intense hue is at a different value. The next figure shows twelve colored squares representing equally spaced hues around the CIELAB color space, at the maximum saturation possible on a computer monitor. 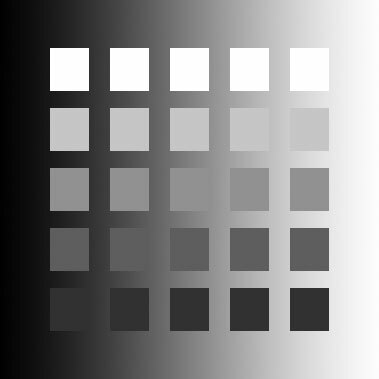 Each gray square around the hue sample is exactly the same value (lightness) as the colored square it contains. These hue value relationships are easier to remember in terms of the shadow ball (at right). Two versions are shown, with similar purple, red, orange, yellow or teal hues shown at reduced saturation (top) and at maximum saturation (bottom) for each hue (displayed on a computer monitor). The contrast between these two figures, especially in the red and violet shadows, and the similarity between the low saturation version and monochromatic version (above), suggests the distorting impact that high saturation colors can have on our estimates of value. Perhaps it was this distracting, deluding effect of intense colors that caused academic painters to call color the enemy of good design.  Hues at either end of the warm/cool contrast, such as scarlet, orange, deep yellow, turquoise and green blue, appear to the eye pretty close to their actual value.  Intense hues that lie above the diagonal warm/cool color contrast, such as middle or light yellow, all greens and cyan, generally appear to have a darker value than they actually do: to compensate, adjust your judgment of the color's value slightly lighter.  Intense hues below the diagonal warm/cool contrast, such as middle red, magenta, violet and blue violet and middle blue, generally appear to have a lighter value than they actually do: to compensate, shift your judgment of the color's value slightly darker. For example, in the Homer watercolor reproduced at the top of this page, the beige clouds and yellow buildings seem darker in color than in black and white, while the middle blue sky appears lighter valued in color than in black and white. This is because the black and white version shows the actual value separate from the confusing effects of the beige (dull yellow) and blue colors, which look darker or lighter than they actually are. This "wheel" is based on the fact that the yellow/blue dimension of hue (b* in CIELAB), and the light/dark dimension of value (L* in CIELAB), are highly correlated  that is, intense yellow hues are light valued, and intense blue violet hues are dark valued. This suggests replacing the chromatic dimension b* in the artist's color wheel with the luminosity dimension L. This separates pigments vertically by value, but keeps the a* (red/green) dimension to show the chromatic contrast between warm and cool pigments. This value wheel serves as a simple lookup for the masstone value of specific pigments. The vertical numbering is in units of the CIELAB L scale. Just divide by ten to get the equivalent artist's 11 step (Munsell) value: ultramarine blue has a lightness of 30, which equals a Munsell value of 3.
to "landscape" and print to fit an 8.5" x 11" sheet of paper. It's striking how well the luminosity and a+/a- or red/green dimensions can reconstruct the artist's color wheel. The wheel reveals the close relationship between value and hue among intense pigments on the "warm" side of the color wheel (from cadmium lemon to quinacridone violet). The top to bottom ordering of intense warm pigments (cadmium lemon to quinacridone violet) in the artist's value wheel is almost identical to the counterclockwise ordering by hue in the artist's color wheel. The important exceptions are among the high chroma pigments at the extreme end of the a+ (red) dimension  pigments between naphthol scarlet (PR188) and quinacridone magenta (PR122). Most of these paints are "really red reds" that differ in how much "yellow" or "blue" reflectance they contain, which means these are hue differences that require input from the y/b opponent contrast to sort out. We can see this in the Coloroid color model (at right): the most intense hues from scarlet to magenta have nearly the same lightness (the Coloroid hue curve is flat), so we can't use lightness alone to distinguish among them. A second area of confusion is the jumble of dull earth and violet pigments across the "warm" (a+) side of the wheel: we find venetian red next to manganese violet and cobalt violet next to quinacridone gold. A third jumble includes the "cool" pigments from yellow green through deep blue on the a- side of the wheel. In these pigments the y/b opponent contrast, specifically the contribution from the B cones, is also necessary to disentangle hue differences within these color groups. At the bottom of the scale are four very dark, blue or purple pigments  dioxazine violet, ultramarine blue, indanthrone blue, and prussian blue. These are commonly used to mix dark and near neutral shadow tones. They are joined by a very dark brown iron oxide (PBr6) and various carbon "black" pigments (which are actually dark grays with a reflectance around 20). By grouping together the pigments that appear well ordered by hue as opposed to the pigments that are shifted out of their expected hue location, the artist's value wheel identifies several pigment "families" defined on hue/value relationships: (1) the earth pigments and other dull yellow or red pigments (low chroma, darker valued than their yellow hue suggests), (2) the cobalts (low chroma, lighter valued than their blue hue suggests), (3) the phthalocyanines (high chroma, darker than their green hue suggests), (4) the red quinacridones (high chroma, lighter than their bluish hue suggests), (5) all other intense warm pigments (ordered closely by value), and (6) the dark pigments (including carbon black). Interestingly, these are the same groups of pigments identified as having distinctly different patterns of color change in the study of dilution and saturation. In any case, once you become very familiar with the paints on your palette, these color "families" may help you refine your judgment of paint apparent values, and remember pigment values in your value designs. The value wheel is primarily a convenient reference to the value of a pigment and other pigments with similar lightness. It clarifies the relationship between a pigment's most intense color and a specific, characteristic value, so you can each value step in relation to a specific pigment. By reading across any horizontal band of the wheel, you can identify the paints with a similar value, letting you first choose a value and then select paints to match it. This can help you to think about the scheme of a painting as primarily gradations of luminosity and saturation rather than hue, and to overcome the visual illusions that make orange appear darker than teal blue, or phthalo green YS darker than quinacridone rose, when they have exactly the same lightness at optimal dilution. The range and pattern of values in a painting strongly determine how it will affect the viewer. But the range of lightness and saturation available in an artist's medium is always more restricted than the range of light and color in nature. There is almost always a large discrepancy between the visual colors of the physical environment and the visual colors of an image medium  printed image, photographic print, painting, video image, slide transparency, color film  we use to represent the world. This discrepancy occurs because the peak values and total range of environmental luminance values are much greater than the maximum luminance or range of luminance possible within an image medium. That is, the average luminance of a summer field in sunlight is much higher than the average luminance of a photograph of the summer field viewed in an art gallery, and the average luminance of the same field in moonlight is much lower; and the ratio between the highest and lowest luminance in the field under either sunlight or moonlight (typically 10,000:1 or more) is much greater than the luminance ratio between the blacks and whites in the photograph (typically around 30:1), no matter how the photograph is illuminated. As a result, the contrast ratio in the image is always smaller than the contrast ratio in the environment, and the common color space by a technique called gamut mapping. This procedure creates an "open" technology: images from different input sources can produce pleasing images through different output sources. To do this, the visual colors of the input image are systematically adjusted to match the range of visual colors possible in the output instrument. We can use this technology as a limited analogy for the process of painting. The input device is the painter's "eye", or visual interpretation of a scene or motif; the output device is the act of painting, in particular the choice of materials and the judgment about color relationships. The analogy only goes so far: some painters strive for a color literalism that is indistinguishable from a photographic print, and others for a color symbolism that communicates a mood, interpretation, or visual style. But the basic problem is either fitting the colors of the world, or the colors of an "ideal" image, into the colors possible with a palette of paints. In gamut mapping, luminance (achromatic luminance) differences are most significant if the medium is based on reflected light (printed images, photographs, paintings), and hue purity (chromatic luminance) differences are significant if the medium is based on trichromatic mixtures (photographic prints, slide transparencies, video displays). The most restricted reproduction arises in reflective images created from trichromatic mixtures (CYM ink prints and photographic prints).  images of light sources. These generally produce the least satisfactory or most obviously artificial images: imagine, for example, a painting of a rainbow. If the saturation is rendered accurately, then the colors appear unnaturally desaturated and dim. The brightness of the light is typically rendered through various types of image flare (such as internal lens reflections, image spreading, or color desaturation), and in the paradoxical case of image burnout, a very bright light may produce a black image surrounded by white flare. In effect, flare serves to symbolize the luminance contrast created by the light source.  dark light environments. The surface contrast ratios in dark settings can be usually be rendered well by material gamuts, but lights and reflections will appear unusually bright. Another problem is that material surfaces under normal display conditions have a much higher luminance than the dark environment they represent, and very dark surfaces almost always show surface texture or gloss. So the physical image appears artificial.  reflections, highlights. These generally can be rendered by very light or white colors, especially if the surface colors in the image are saturated and/or dark valued, so that adequate contrast is possible.  illuminance contrasted surfaces. These are .  brightly illuminated surfaces. These are . Gamut Mapping By Projection. The method that is generally optimal for gamut mapping is to project the real world gamut into the material gamut along lines from the real world color to the gamut middle gray. Gamut Mapping By Distortion. In the past decade, methods have been developed (32 bit encoding) to represent a larger dynamic range in digital images than has previously been the norm. When these images are displayed in media that can reproduce a larger dynamic range than has previously been available in traditional video or computer displays, the result is an image with a much higher contrast ratio and more spacious light environment. These are true high dynamic range images (HDRI). In parallel, methods have been developed to simulate or approximate the appearance of these images within the contrast ratios available in standard digital cameras and visual displays (8 bit or 16 bit images). These are often also called HDR images, although they are actually simulated high dynamic range images (sHDRI). The procedures used to create these images are described here, but it is useful to understand the basic compression strategy that can simulate a simulated high dynamic range (diagram, below). Overall, the simulated HDR image enhances the lightness contrast across the darker and lighter values, while strongly compressing the lightness contrast across the middle values, compensating for this midrange loss of lightness contrast with chromaticity contrast. This schematic suggests the main differences across different media. If we take as our basis of comparison the luminance values that appear in a daylit landscape (natural light gamut), and compare these to a photograph of the same scene, the photograph will have a much more restricted gamut; the brightest whites in the photograph will be much darker than the matching surfaces in the real world, although the darkest darks in the photograph will be darker than the matching surfaces in the real world. A watercolor painting is even more restricted in chromatic range and along the dark side of the gamut. Somehow the ideal range of natural color has to be squeezed into a smaller range of paint color. This problem is called gamut mapping  squeezing a larger gamut range into a smaller or different range in a way that makes the squeezed colors appear "natural" or "accurate" to most viewers. It is intensively studied in color reproduction and imaging technologies, and it is an essential aspect of painting skill and artistic vision. As Picasso famously said, "some painters turn the sun into a yellow spot, while others can transform a yellow spot into the sun." Gamut mapping is very familiar to photographers, who learn how to use a photometer to translate actual light values into exposure time for a film emulsion, with the knowledge that the exposure of light passed through the negative onto photography paper, and the amount of time the paper is exposed to developing chemicals, will produce a "natural" value structure in the final photographic print. This serves as our point of departure. We can also learn from research that has been done on the gamut mapping problem in the imaging industries. A Painter's Basic Value Plan. All professional photographers are familiar with the zone system of photographic exposure and printing, developed by Ansel Adams. The zone system links an ideal photograph  the photographer's concept of how the finished image should look  to the exposure properties of their film. Painters do not have the apparatus problems of a photographer, but they do face a similar value design problem: anchoring the middle value of a painting in a way that communicates the intended feeling of light or dark without sacrificing a complete representation of the tonal range. Our visual system naturally adjusts to the average luminance in our environment to produce the best visual representation. Because this adaptation also affects the appearance of any physical gray scale, the key to the value design of a painting lies in the distribution of gray values across the luminance range. What should this distribution look like? The diagram at right shows a basic value plan that can serve well in thinking about the value range of any painting. The CIELAB L* scale, which is a benchmark measurement of surface reflectance and the vertical scale used in the artist's value wheel, represents the basic reflectance range; this is overlaid (in orange) with the value range used to describe paints in the guide to watercolor pigments. Against these lightness benchmarks I've inserted the 9 steps of a simple design system. The two important features of this value plan are that (1) the reflectance range goes no lower than 20, which is the effective value range of watercolor paints; and (2) the reflectance intervals are wide in the middle and narrow at both the light and dark ends. Indicated for each zone are some of the physical surfaces that typically have that reflectance. This scale can be linked to the method of dilution recipes for value, which is probably of most interest to painters who build their values through successive glazes, but for the rest of us is a rough guide to the concentration of paint necessary to produce any desired value. Creating a Value Scale (Grayscale). It will be useful to explain how value scales are derived from the apparent values of the natural scene we want to represent. Value scales or grayscales are usually constructed to have perceptual interval scaling: each value should appear to be approximately midway between the values on either side, and the middle value (middle gray) should have an apparent lightness roughly halfway between the darkest ("black") and lightest ("white") values. The question is how we get to those values, and how the grayscale values relate to the original scene values. 1. A Naive Value Scale. Let's start with the naive assumption that differences in the luminance (light intensity) in the scene we want to reproduce should equal differences in the luminance of the painting we look at, when the painting is displayed under optimal or standard lighting. This suggests that the value scale should space the lightness intervals evenly across the luminance range  scene luminance = painting luminance  as shown below. The total range of light adapted visual response is bounded by a roughly 100:1 ratio between the darkest and the lightest luminance, so this applies to the scene as well as the painting. The top end of the luminance range would appear "bright" and the bottom end "dark". Naively, we would also assume that a middle gray is roughly in the middle of the luminance span  in the example, at around 2500. There are obvious practical problems with this value scale. As the luminance range changed across different scenes (for example, from sunlight to twilight), the luminance range of each painting would change as well. But the painting luminance patterns would have different effects depending on the level of surrounding illumination: a daylight painting would have to be viewed in daylight, and a nighttime painting in the dark. So each painting would have to be displayed under its own lighting conditions. 2. Visual Reflectance Steps. These practical problems mean we have to make two fundamental corrections to the naive value scale. First, we have to shift to reflectances relative to a standard white value. This limits all our value judgments to related color judgments, and also makes them more or less independent of the viewing illumination (within the normal range of indoor lighting). Second, in order to get apparent visual equality in the difference between two value scale steps, the actual light intensity between two steps must be unequally spaced to compensate for the visual system's response compression to the light stimulus at higher luminance values. That is, as the stimulus intensity increases, the changes in luminosity necessary to produce an equal visual effect must increase as well. This gives the reflectance to value relationship a characteristic downward sloping curve as the value increases. The exact shape of this curve is different for different color models, but all have a very similar shape. The example shows the CIELAB L* scale, which is also identical to the Munsell value scale (with each value multiplied by 10). With a reflectance value scale such as CIE L*, it is possible for some areas of the scene to exceed the luminance of the white standard. For example, a white porcelain bowl or the surface of a lake may reflect sunlight as highlights, or a white paper displayed in a darkened classroom will appear darker than a white paper in sunlight seen through a window. In such cases we either accept a value of L greater than the white standard of 100, or we take the brighter white as the new white standard and adjust all other values accordingly. 3. Media Compression. However, in photography, the film emulsion and print paper have a fixed "white" transmision or reflectance value. 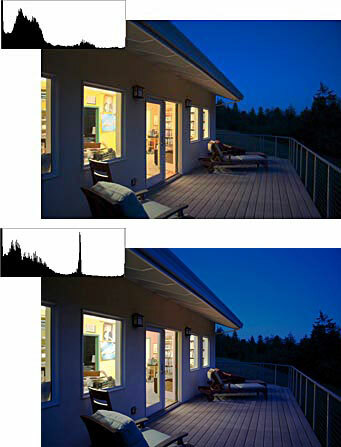 In natural scenes, random highlights or contrasts in illumination can produce a much wider range of luminance values, so the media must compress this wide range of values into the fixed range of reflectances possible within the specific media. This is the fundamental difference in luminance patterns between "real" scenes and their representations. Photographers use light meters and exposure settings to adjust the light coming into the camera so that a visible white in the scene corresponds to a visible white in the finished photograph. But brighter areas of the scene, such as specular (reflected) highlights, do not get an even higher white value  they are rendered in the same white as the standard "white" surface. So there is a specular compression in reflectance media, which flattens extreme luminance values into the same, top end "white" value. 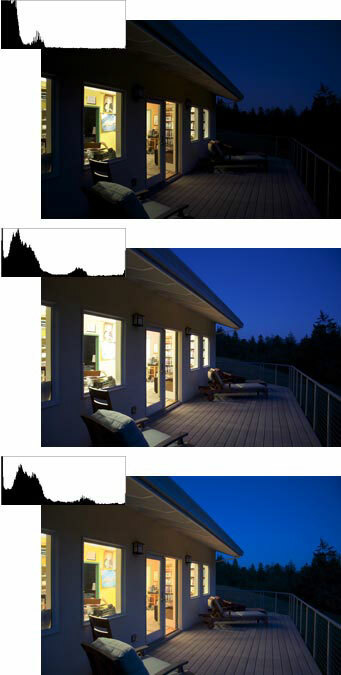 In most photographs, small changes in the scene luminance at the low end of the visible range are difficult or impossible to separate as different darks in the photograph. In effect, a single very, very dark value stands for all values from the darkest value of the media range down to zero luminance. So there is also media flattening of luminance differences at the bottom end of the scale, which is too small to see in the diagram. By using the photographic example, we hold onto the relationship between scene and media values. If we know all details of the camera exposure settings, emulsion speed and development chemistry, it is in theory possible to relate the photographic value back to the corresponding scene luminance. An artist's value scale, for example the kind of scale that painting students prepare by mixing black and white paint to equal value steps of gray, or the commercial grayscales available from photography supply stores, will approximately match the luminance curve of this idealized grayscale. But those grayscales have no relationship to the luminance range within a specific scene. 4. Artistic Value Range. When we turn to paintings, or the actual density range of photographs, many significant changes enter the value scale. If we stay with the example of watercolor media, then the first change is that the range of values within the media is restricted in comparison to the conceptual range possible in the CIE L* scale. Watercolor paints on white paper have a potential range from about L = 97 to L = 20, or a value range of about 75. This puts the middle gray value at about L = 60. All media reflectance scales, including photographic grayscales, restrict the range of actual values in a similar way. In addition, artists tend to interpret the values in a scene as a distorted range of values in the painting. Painters tend to assign a large range of natural luminance variation at the extremes of their visual range to a narrow range of paint values, which flattens the value curve at both the top and bottom ends. They also tend to make fine discriminations among the middle values, which assigns a relatively wide range of paint values to a narrow range of luminance values around the middle gray. The result is a characteristic "S" shaped curve. Finally, artistic license means that we no longer have the indirect but explicit relationship between scene and image luminance that we potentially retain in photography. So there is no way to compare painting values to natural values, or to judge the actual average luminance of the original scene. If you compare this curve to the zone scale shown above, you should be able to see why the reflectance intervals are wide around the middle value: this is where the curve is steepest in relation to the reflectance scale and to the original values. Where the curve is close to vertical, at either end, large changes in the value intervals correspond to small changes in the reflectance, but these reflectance changes are smaller at the light end of the scale. This also corresponds to the visual effect known as crispening, where values close to the background or average reflectance of the scene appear more highly contrasted than values at either end of the visible range. This general distribution of values  the strongest contrasts in the middle range, with reduced lightness variations at the extremes of the range  produces the most gratifying contrast across the widest range of values possible with watercolor paints. Industrial Gamut Mapping. The problem of media value compression not only occurs between the actual scene and its representation in a specific medium, but between two different media representing the same image. Gamut mapping in the printing and imaging industries must tackle all aspects of color transformations  chroma in particular. The rules developed in these applications provide a unique perspective on the gamut mapping problem. In this context, the image that the artist intends to reproduce (landscape, still life or abstract design) is source or original color space, and the range of color mixtures possible with paints applied to paper is the device or media specific color space. The media colors can be manipulated to achieve different goals. For painters, the most relevant are probably pleasing color reproduction (the image colors are not necessarily accurate in comparison to the source colors, but they are sufficient or customary when judged in terms of the image taken by itself) and preferred color reproduction (the colors are the best possible, or the most commonly preferred, out of many possible ways of color rendering the same source image). To simplify things we always assume that the colors in the painting will be viewed under sufficiently bright, white light. The diagram at right shows the alternative gamut mapping solutions. If we take a vertical slice through a color solid (such as Munsell or CIELAB) as our source colors, and look for ways to represent its colors within the somewhat reduced range of saturation and lightness in watercolor paints, then we can do the mapping in one of four ways: (1) chose a color with the same hue and equal lightness at a lower chroma (L in the diagram), (2) choose a color with the same hue and equal chroma at a lower or higher lightness (C), (3) choose a color that is the nearest available color in the media color space, whatever its lightness and chroma (n), or (4) choose a color that is the nearest available color in the direction of a middle gray in the media color space (G). How do these different strategies fare when judged across many different types of images? In general, the fourth strategy  shrinking the source colors toward a middle gray value, until the source gamut is mostly contained within the media gamut  is the method producing the most pleasing and most often preferred results in all media. This is done by (1) mapping the range of lightness values until the most extreme light and dark contrasts in the source are matched by the most extreme light to dark contrasts in the media, and (2) preserving the middle gray value to be the same. Then (3) chroma values are clipped until all hues fall within the media gamut. There are many subtleties in the implementation of these general rules. For example, it may be permissible to alter the hue or lightness of the media color to achieve the desired saturation impact. A yellow might be changed to a yellow orange if a darker value at high chroma is needed; a blue green might be made darker to increase its saturation in the image. The chroma of the media colors may need to be reduced in order to match a reduced chroma range in the source: few landscape painters use their paints in pure form because the pigment colors are more intense than those in nature, especially in foliage greens. Finally, the lightness of some media colors may need to be reduced or increased to match the overall balance of colors in the source. A common problem arises with landscape lighting, in which sky blue must be increased in value to create sufficient contrast with shadow and surface darks of the soil. This kind of problem may require you to adjust the distribution of light or dark across the entire image (see below). The overriding rule is to match the middle gray as closely as possible, and adjust all other values in relation to it and in proportion to the maximum range of light or dark possible with white paper or dark paint. Once this is done, the tendency of watercolors to reproduce higher saturations in warm hues and lower saturations in greens, blues and purples must be compensated to match the overall balance in the distribution of chroma in the image; the specific hue of any color area can be shifted to an analogous hue, or the visual area of very intense colors can be reduced (for example, from the entire surface of an object to only the most brightly lit areas of the object), to make this balancing act work. High Dynamic Range Images. In the past decade, methods have been developed (32 bit encoding) to represent a larger dynamic range in digital images than has previously been the norm. When these images are displayed in media that can reproduce a larger dynamic range than has previously been available in traditional video or computer displays, the result is an image with a much higher contrast ratio and more spacious light environment. These are true high dynamic range images (HDRI). Basically, the simulated HDR image greatly enhances the lightness contrast across the darker values, while compressing the lightness contrast across the middle and light values, compensating for the loss of lightness contrast with chromaticity contrast. (Compare this simulated image with this actual HDR image, created using the Photoshop HDR plug in). Painterly Changes in Value Range. How does a painter incorporate these basic mapping strategies into his or her technique? The key is that the painter essentially works the value design problem in a different direction from the photographer. Both visualize the "ideal" picture, but the photographer must adjust exposure to ensure the negative shows detail in all but the darkest or lightest values, while the painter must use paint mixing to anchor a middle gray at the right luminance to define a visual style or a specific luminance adaptation. In either case, the middle value is shifted lighter or darker, which crowds one end or the other of the value scale. As already discussed, high saturation appears as an added luminance in a color, so painters must evaluate lightness in terms of the combined luminance and chroma of the color, rather than luminance alone. The example below illustrates the basic problem. 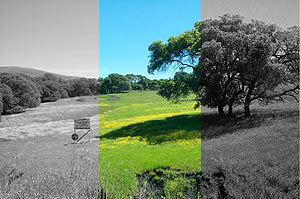 The sample on the left retains the visual lightness contrasts by combining lightness and chroma as grayscale differences, producing nice contrast between sky and trees, trees and grass, and grass and flowers. The sample on the right is produced by desaturating the color (removing chroma information without adjusting value), which produces comparatively muddy grays. A second issue is the location of the middle gray value in relation to the total value range of the media. Design approaches that emphasize a restricted or imbalanced luminance range are a traditional method for creating a distinctive, atmospheric mood. Three versions of the same photograph show the typical effects. The typical watercolor resembles the image at left, in which the landscape mid values are reproduced at a higher value in the painting, creating a luminous, sun drenched effect. This kind of gamut mapping suggests vision overwhelmed by light. We have come out of a dark cellar, and our first impression is that everything is bathed in intense light. Every detail in the shadows is crisp and clear, but the brightest areas of the landscape blaze and blur together. In contrast, the example on the right, in which the landscape mid values are much darker in the painting than in the actual scene, illustrates the typical Claudean landscape, which exploits the ability of oil paints to produce rich darks. The Claudean alternative suggests vision overwhelmed by shadow. This is why the sun is always near the horizon in a Claude landscape: because the light is rapidly fading, our light adapted eyes can't yet see into the encroaching shadows. Usually cloud detail in the sky is crisp and clear, but forest shadows are dark and difficult to penetrate. In fact, most watercolor painters would spread out the middle values and push areas of near dark toward the bottom limit of the painting media, resulting in the ogive "painter's value plan" described above. Here is the same photograph using that gamut mapping strategy. Note that it lets the painter show a sun drenched landscape while suggesting the same visual contrasts within a smaller lightness range. A painter who wants to imitate either effect starts by shifting the middle value lighter or darker. For example, to produce a lighter valued painting, tanned skin and weathered wood would be painted at a reflectance of 70 or 75, rather than the 55 of normal vision. To produce the Claudean darks, the same woods and skin would be painted at a lower reflectance, around 45 or so. These adjustments can be worked out using the artist's value wheel to select the appropriate paints, and the paint dilution recipes to work out the appropriate paint dilution. There are three contrasting techiques to do this. The first, recommended by painters such as Trevor Chamberlain, is to paint the middle values first, to establish the overall tonality and the range of values from the middle toward light and dark, and to reduce the amount of white paper showing, as white paper makes the paint you're applying appear darker than it really is. The problems with this approach are that the white paper will make you misjudge the initial gray anyway, and that the color will seem to fade because of watercolor paint drying shifts. Both narrow the differences you can show at the top end of the value range. You must have excellent paint control to navigate these problems. The second approach, recommended by Joseph Zbukvic, is to work methodically from lightest to darkest values, without skipping a step. This allows you to correct as you go, pushing the middle values darker if the lighter values already established demand it. The problems with this approach are that lighter values appear to grow even lighter as darker values are added to the painting, and by incrementally increasing the values you may run out of room to show differences at the dark end of the range. Painters like Chamberlain and Zbukvic are alike in their ability to nail a value on the first pass. Given the natural tendency of watercolors to fade as they dry, we'd expect Zbukvic's method to be the better one for watercolor painters to use  at least, until they become as skilled as Chamberlain. The last method for gaining control of the value range is to use many glazes to build up the painting, adding more and more layers to the middle and dark values until you've pushed them down far enough to resemble the middle picture above. I find this method is excellent for precise modeling of subtly contoured forms, and can flesh out the full value range, but tends to look overworked or bland if the goal is delicate color effects. After drilling down on the topic of color values, we can formulate a few basic rules for modeling shadows. (These should be studied along with the section on modeling forms). In an artificial setting, as colors move into shadows from a single light source, the surfaces of objects do not usually change in saturation: the shadow area is a lower value of the same color at the same relative saturation. This is modeled by simply adding a dark near neutral paint, such as neutral tint, ivory black or lamp black to the color. This reduces the saturation in the same proportion as the value. In natural light the effects are more complex. Direct light from the sun appears as close to white, while indirect light (scattered from the sky) is colored blue. If an object is directly lit by the sun, its shadow areas will receive some light from the sky, and this acts to raise the shadow value from the dark value created by direct indoor lighting, and also to mix blue with the local (surface) color. If the local color is warm (red through yellow), this added blue acts to lower the saturation of the surface color, just as mixing blue in the red paint will neutralize it. If the local color is a cool green or blue, the saturation is unaffected or may even slightly increase. This indirect light also shifts the hue, in general toward blue. When painting these effects, mixing shadows with the mixing complement of the local color is almost always wrong: it desaturates the color without shifting the value. Mixing with a blackish color, such as neutral tint, is better, since it shifts value primarily but also saturation (because colors lose saturation in shades). But the more common solution, especially for landscape artists, is to use as the "cool" shadow hue a dark blue violet (such as dioxazine violet, indanthrone blue, or any dark mixed violet), or a dark, near neutral convenience mixture with a blue tint (such as payne's gray or indigo). This method shifts value very effectively, since the small amount of blue hue acts to reinforce other blues and greens but to desaturate warm hues. But it also shifts the hue: for most warm colors and greens, these dark shadow colors shift the mixed hue toward blue. Usually this hue shift is quite small because the shadow color is so unsaturated that is almost equivalent to gray. So some artists go the extra mile and actually model shadows by shifting the hue towards a cool color: the shadow of a green object is painted blue, the shadow of a red object is painted maroon. Many artists get similar effects by using a less desaturated dark blue (ultramarine blue or prussian blue) as their shadow color, since these colors appear "cool" in relation to all warm and most green hues. This "purple shadow" method is often good to represent the complex chroma and lightness shifts of shadows in natural light. But other artists use other methods. Christopher Schink models both light and shadow by shifting the hue of the local either color warmer or cooler (a red becomes a warmer orange in bright light, a cooler magenta in shadow), which is of course the method innovated by Paul Cézanne for rendering form without using value changes. Jeanne Dobie thinks shadows must always be the same hue as the local color, neither warmer nor cooler; she reserves warm or cool color changes for the highlights and the transitions from light to shadow, depending on the type of light. These different approaches suit different painting styles, but also different types of illumination. For objects under other lighting, the technique may be too simplistic. In particular, if the indirect light is colored by its source (for instance, a red wall, or a green neon sign), then the hue shifts and desaturating effects have to be worked out as if this hue were "mixed" with the local color of the objects the light falls on. The quality of shadows depends on the amount of light, the color of the direct light, the colors of indirect or reflected lights, and the value and saturation of the surface color of the objects. The only general rule is that lightness, chroma and hue (color temperature) may all change from light to shadow. And if it's any consolation, these effects have been among the most difficult problems for color psychologists to understand! Anyway, to conclude with tonal values: many books recommend that you squint to see the value structure of a painting or scene. This is handy for daylight and quick assessment of values, but it requires practice to learn. Actually, the most accurate way to judge the value structure of a painting is to look at it under very dim light, such as moonlight, when only the rod receptor cells (which cannot perceive color) are active. If you get up at night for some reason, use the opportunity to look at the value structure of your paintings! This will help you to use the "squint" method on the same paintings during the day, and from there to apply the "squint" to other objects in all kinds of light.